Meet the Builder - Nugent Builders, Inc.
Nugent Builders bring a more complete construction package to the table while remaining competitive in today's housing market. Their construction professionals plan the project from start to finish with a proven system that includes designing, budget estimating, value engineering, and computer schedule development. 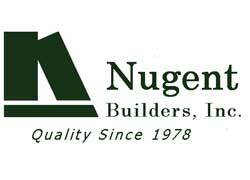 Their experience, integrity, and strong commitment to their customers, combined with their goals of building a long term quality relationship with their customers, suppliers, and subcontractors is the foundation of the Nugent Builders' impeccable reputation.